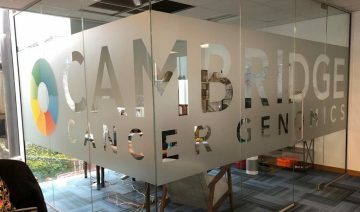 A friendly, personalised sign writing and graphic design service based in Cambridge with a reputation built on service, quality and fast turnaround. Help your company to grow awareness and business by standing out from the crowd, whether it’s retail space, offices, warehousing or vehicles out on the streets. Our creative skills and signs experience can take your signage ideas and make them a reality. We are an established family sign making business with a reputation built on quality and speed of service. Whether you are looking for shop signs, custom signs, large full colour banners, business signs, vehicle wraps and signage, digital wallcoverings, directional signs or exhibition graphics we have a solution that’s perfect for your project. 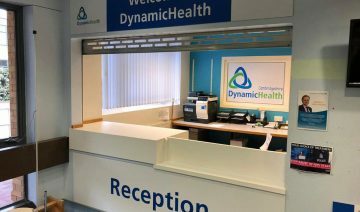 We always love a challenge and pride ourselves in our ability to provide our clients with unique solutions – why not take a look at some of our latest signage projects. Footprint Signs and Graphics have the skills to take your creative idea and make it a reality. Vinyl wraps for vans and cars are a very big part of the daily signage and graphics work we do, and with the range of vinyl colour and finish effects growing all the time, the finished results always look stunning. 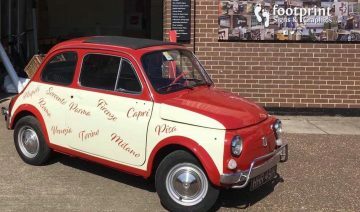 What really caught our eye recently though was this super cute partial vinyl wrap for a classic Fiat 500. As it’s the film and Oscars award season we thought we’d focus on some films of our own to recommend! We’ve fitted a wide range of glass and window film solutions recently, from glass privacy film, etched glass effects, solar film and promotional window graphics. Architectural finishes are self-adhesive decorative laminate materials designed for interior decoration and refurbishment projects. They’re becoming increasingly popular as clients see how they can be used to bring new life to tired fixtures and fittings, at a fraction of the cost of replacement.